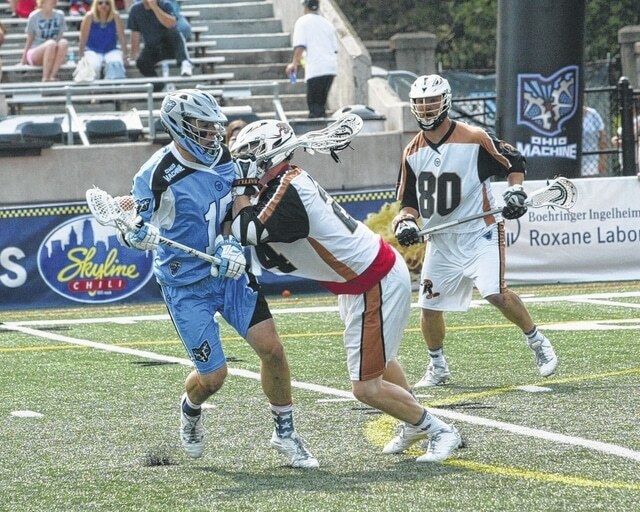 Peter Baum, left, is checked by a Rattlers defender during the first half of Saturday’s MLL showdown at Selby Stadium. The Machine was in control by halftime, and led heading into the fourth quarter, but the visiting Rattlers finished strong en route to a 16-15 win Saturday at Selby Stadium. Rookie Jimmy Bitter and team captain Marcus Holman led the way offensively for the Machine (6-5). Bitter had six goals in the game, which tied the club’s all-time high for goals scored in a contest. Holman had a hat trick with two goals in the second quarter and one goal early in the fourth. While the team fizzled a bit at the finish, the start was just what Ohio was looking for. The Machine scored four goals in the first quarter and goalie Brian Phipps limited the Rattlers (6-5) to just two tallies. Brian Karalunas started off the game with a bang and scored in the first 10 seconds. The goal was also the first of Karalunas’ five-year career. In the second quarter, Phipps continued to make his presence known in goal and held off a total of nine shots in the first half. Bitter had a hat trick with three goals while Holman scored his 30th and 31st goals of the season. The Machine led the Rattlers 8-3 at halftime. The Rattlers made a comeback in the third quarter with three goals by Mark Matthews, two goals by Dave Lawson, one goal by Randy Staats and one goal by Jack Near. Bitter responded with two more goals and Greg Puskuldjian scored his first career goal coming off of an exciting faceoff. However, the Machine could not hold on to its momentum and the Rattlers took the lead in the fourth quarter. The Rattlers offense, led by Matthews and Lawson, added six goals in the period to storm in front. Both Holman and Bitter responded with goals and Machine midfielder Tom Schreiber had a two-point goal in the last seconds of the fourth quarter to cut the deficit to one, but it was not enough to secure the win. Coming off the tough loss, the Machine will hit the road Saturday to face off against the Boston Cannons. The Machine returns to Selby Stadium on July 18 to face the New York Lizards for the second time this season.